A two-time Grammy award-winning artist, Bill Harley’s songs and stories paint a vibrant and hilarious picture of growing up, schooling and family life. Singer, storyteller, author, playwright, educator, performing artist – welcome to the world of Bill Harley – a world of wit and wisdom. Storytellers were our first magicians, our first history keepers, society builders, culture shapers and spiritual and emotional filters, making sense of the world long before written communication. For all our sophisticated technology and mass electronic entertainment, we still need those voices in the dark, by the fire, in the hall. A master storyteller connects us and intimately affirms our lives with resonant truths, no matter how embroidered, funny, mysterious or horrific the tale. Bill Harley is a master storyteller. The nationally touring, critically-acclaimed singer-songwriter, author, musician and monologist is considered by fans and peers alike to be one of the best storytellers in the country for his celebrations of commonality and humanity through comic narrative songs and confessional spoken works. But tagging Harley with the “children’s artist” label, even of the top-drawer variety, is as deceptive as this gifted artist’s Puckish demeanor. In slice-of-life vignettes about school and family life, Harley uses humor and a fine-tuned sense of the ridiculous to illuminate compassionate truths, even while inspiring belly laughs. Adults absorb a Harley performance through a double filter of past and present. Children respond from the immediacy of their own lives, as with rubber-faced abandon he examines human foibles, flaws and embarrassments, common fears and simple pleasures. 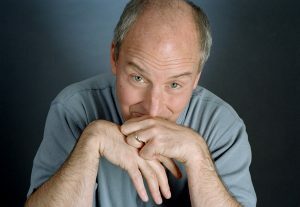 Playwright and author David Kranes was artistic director of the respected Sundance Playwrights’ Lab when he heard one of Harley’s National Public Radio performances and invited him to Sundance in 1990 to participate as a “strong and individual voice” outside the traditional realm of theater. Harley’s work resonates, Eustis believes, because he is “simultaneously” a son, a father, a husband, a child and a grown up, and has remained true to all those facets of his life. Harley, who lives in Seekonk, Massachusetts, with his wife and professional partner Debbie Block with whom he has two grown sons, graduated from Hamilton College in Clinton, NY, in 1977 with honors and a religious studies degree. He found his calling in community service, not the seminary, leading a program in conflict resolution for families and educators and co-founding with Block and others a community-based adult education platform. He was receptive early on to folk artist/activist Pete Seeger’s use of music as an expression of community. Supportive, too, of other musicians, Harley and Block were among the founders of Stone Soup Coffee House in Rhode Island, a music performance venue now in its 28th season. As a folk musician in the Seeger, Woody Guthrie tradition, Harley still lends his voice to social justice, environmental and political causes. Harley began his work with children while still in college and released his first album, “Monsters in the Bathroom,” on Round River Records, the label he co-founded with Block in 1984. Twenty-eight albums later, Harley’s work includes song and story collections for adults, and a diverse mix of world music, reggae, blues, folk, rock, jazz, do-wop and more. In recent years, Harley has authored eight children’s picture books and two novels for gradeschoolers. Among his theater projects are “My Sarajevo,” a full-length play set during the Bosnian war, and “Stickeen,” a retelling of stories from the life of naturalist John Muir. Whatever Harley’s forum, it’s always all about story, community and connection. One story and one song at a time.